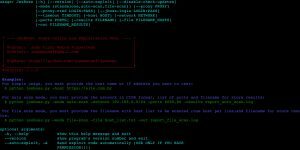 Browse: Home / JexBoss v1.2.0 – Jboss verify and Exploitation Tool. JexBoss v1.2.0 – Jboss verify and Exploitation Tool. * Added support for exploiting java deserialization in any HTTP POST parameters (like javax.faces.ViewState). * Added support for exploiting java deserialization in generic Invoker servlets (any application server). * Added gadgets to exploit multiple application servers that has commons-collections or groovy libs in the classpath. * Added support to easily make a reverse shell connection when exploiting java deserialization vulnerabilities. * Added exploits for Jenkins CLI and Tomcat RMI (CVE-2015-5317, CVE-2016-8735, CVE-2016-3427). * Added support for load your own gadget from file. * Several fixes and improvements. JexBoss is a tool for testing and exploiting vulnerabilities in JBoss Application Server. The tool and exploits were developed and tested for versions 3, 4, 5 and 6 of the JBoss Application Server. ← Satangle – Script which helps the creation of antivirus evading malware.